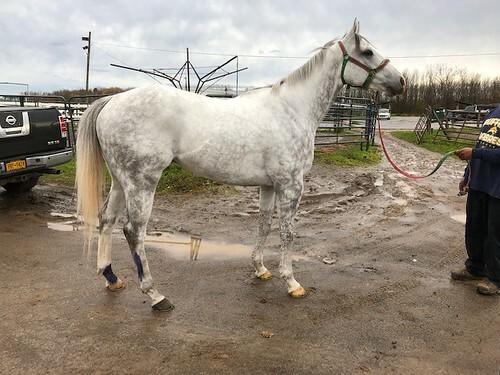 We saw this gorgeous, lovely moving grey guy just one day after he had raced, and he showed no post race stiffness at all, exhibiting a very light and flowing flat kneed trot that should show well in the hunter ring. 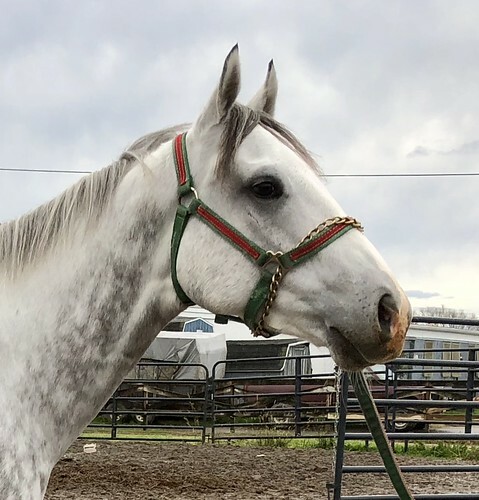 His owner said he is a very sweet horse, very sound with no vices, and that peppermints are a sure way to win his affection! Stone to Gold was very friendly with our volunteer (although disappointed that she had no peppermints for him! ), and he was quiet and perfectly behaved for his photos and jog. 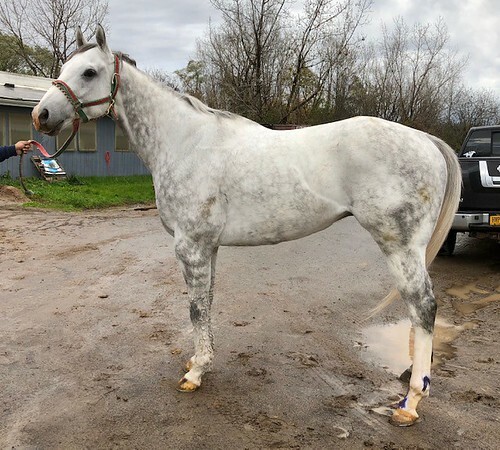 He had some bluekote on a hind leg to treat a scrape from the race the day before on a muddy track, and there was still post-race poultice residue on his front legs, but we could see that he is clean legged. 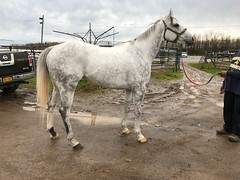 While he has raced well this year, with one win and 4 thirds, his owner realizes that the end of the Finger Lakes racing season is rapidly approaching, so he wants to see if he can find a great new home and career for Stone to Gold while he is sound, happy, and his potential for any new career is at its peak. This guy can go in any direction, with no limitations. He moves well enough for dressage or the show hunters, and his quiet friendly temperament will win anyone over! He is by Bustin Stones, a son of City Zip, and he is out of a mare by French Deputy, a son of Deputy Minister. These are lines known for good brains and jumping ability. 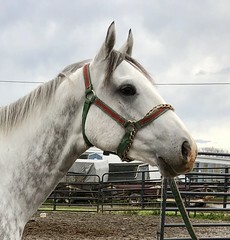 Young sound athletic great moving grey geldings are the most popular horses, so move fast if you want to bring Stone to Gold home with you to feed him as many peppermints as you can!